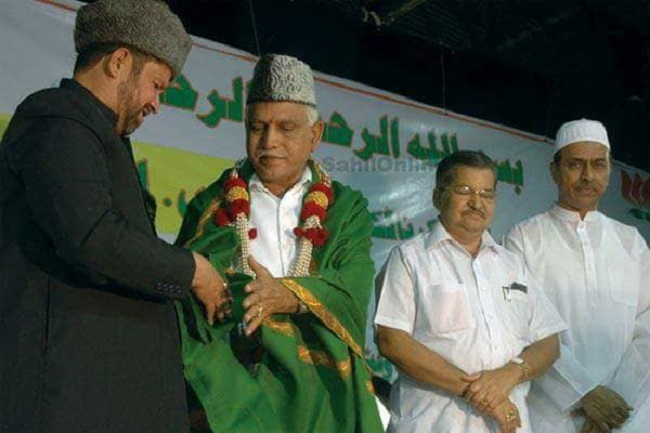 Why is BJP against Tipu Sultan, and was this always the case? Is this an attempt at consolidating the Hindu vote bank, across castes? Yes and no. The Karnataka government’s plan to celebrate Tipu Jayanti on November 10 is on schedule – and so is the BJP’s plan to oppose it. They have held protests in many parts of the state, and have fallen back on their usual criticism of the ruler of Mysore to justify their protests: That Tipu Sultan was a ‘terrorist’, that he persecuted Kodavas and Catholics in Mangaluru. They have pitted Tipu against Onake Obavva, a legendary Dalit woman who died fighting his father, Hyder Ali, when he invaded the Chitradurga Fort. In all, the BJP is trying its best to make Tipu Sultan out to be a villain, and the Congress government in the state ‘evil’ to be celebrating him. But was the BJP always against Tipu Sultan? Was the Tiger of Mysore always untouchable for the saffron party? The long answer is that like every other party in Karnataka, the BJP, too, has celebrated Tipu Sultan before 2015, although to make Tipu Jayanti a state sponsored event was the doing of the Congress. 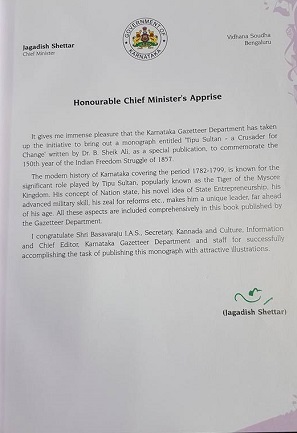 In fact, back in 2012, the Department of Kannada and Culture had published a book titled Tipu Sultan – A Crusader for Change. Authored by Dr Sheikh Ali, the 338-page monograph speaks of Tipu’s achievements, acquisitions, and his fight against the British Empire. In the book, there is a message from the then Chief Minister – BJP’s Jagadish Shettar. “In that letter, he (Jagadish Shettar) praises Tipu. In that letter, he even acknowledges that Tipu was a part of the Freedom struggle. What changed in 2015?” asks Brijesh Kalappa, a legal advisor to the government of Karnataka, adding that the anti-Hindu stand taken by the BJP is a mere political gimmick. 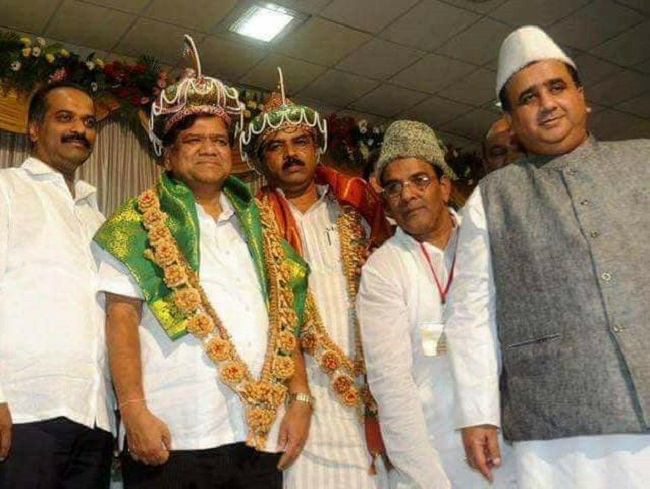 There is also the matter of pictures of Jagadish Shettar, Yeddyurappa, R Ashok and other BJP leaders wearing ‘Tipu Sultan turbans’ at public events before 2015. “Tipu Jayanti existed even before 2015. It was just not a state-sponsored celebration then. There are pictures of Jagadish Shettar, Yeddyurappa, R Ashok and other BJP leaders celebrating Tipu Jayanti. They are wearing Tipu-style turbans. They may claim that it was an Iftar party but these pictures were clicked before 2015 and they were at functions organised by the Muslim community. These were Tipu Jayanti functions,” Brijesh Kalappa says. Calling the BJP a ‘set of opportunists’, he adds, “The Indian Railways runs a train from Hubballi to Mysuru called Tipu Express. The BJP came to power in the Centre, so why have they not changed the name of the train? In the Class 8 CBSE textbook, there is a chapter praising Tipu. CBSE falls under the purview of the Human Resource Development Ministry. If the BJP was anti-Tipu, why have they not removed that chapter praising Tipu?” Brijesh asks. Stating that the BJP was only trying to divide the voters on communal lines, Member of Legislative Council, Basavaraj Horatti said that BJP state President BS Yeddyurappa had visited Tipu’s monuments multiple times when he had left the BJP and formed the Karnataka Janata Paksha. “If he was so against Tipu, why did he visit them?” Basavaraj asks. So if Tipu Sultan was not always untouchable for the BJP, why are they campaigning against him now? According to the Congress, this is an attempt to divide the vote bank along communal lines. “The BJP knows that they will not be able to get the votes of the Muslim community so they are making anti-Tipu statements to gather the Hindu vote,” Basavaraj Horatti says. But a BJP leader tells TNM that the party’s anti-Tipu stand is purely ideological. “He is a terrorist, he persecuted the Kodavas, and the government should not be celebrating him,” he says. A person with knowledge of the BJP’s campaign in the state, however, tells TNM that this is an attempt at consolidating Hindu votes in Karnataka – especially in the coastal areas, in Kodagu, and in Tumakuru. “The plan is to unite upper and lower castes in the state, and to make Dalits in Karnataka vote as Hindus, and not as Dalits,” he says. But will this strategy actually translate to votes for the BJP? “You need to see the larger picture. The anti-Tipu campaign is just one part of the BJP’s strategy in Karnataka – and it will go a long way in painting Siddaramaiah as anti-Hindu,” he says. Read: Tipu Jayanti: Did both the BJP and the Congress pick the wrong battle to fight?